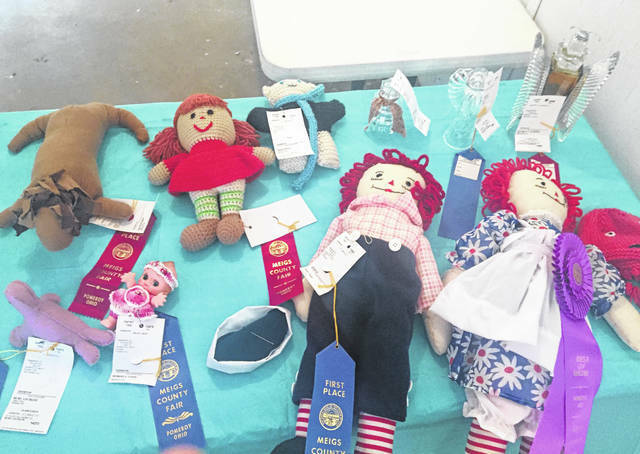 Shirley Hamm took the top prize for her Raggedy Ann and Andy dolls. Brenda Kennedy received 1st Place for quilts. 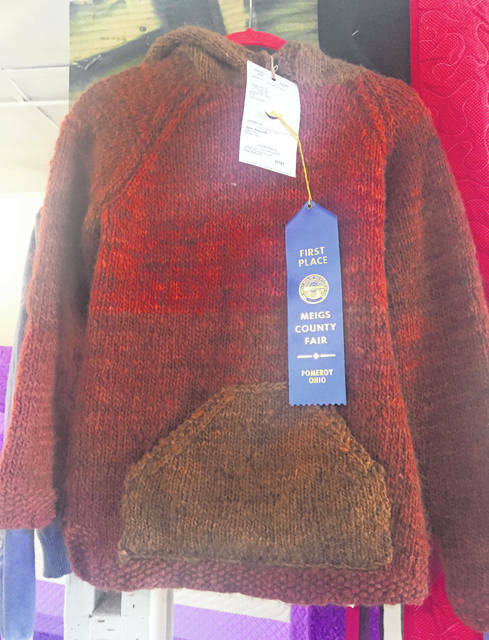 Julie Bancroft knitted this 1st Place sweater. 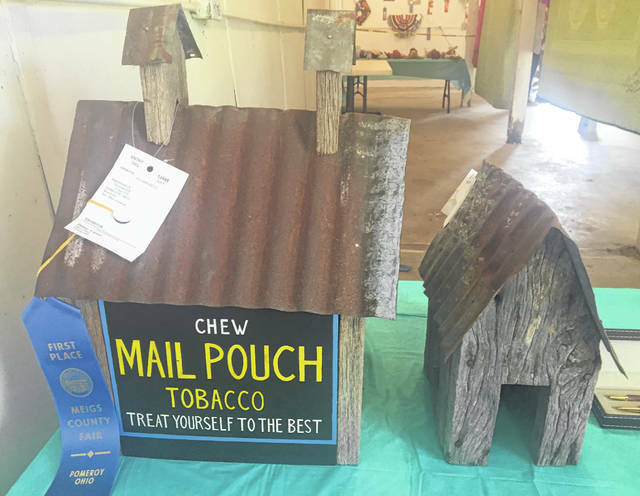 With his woodcraft birdhouse, Danny Carter of Vinton took 1st place with his Mail Pouch Birdhouse. Woodworking projects were among the domestic arts items entered in the fair contests. Scrap Art by Robert Bailey took first place. 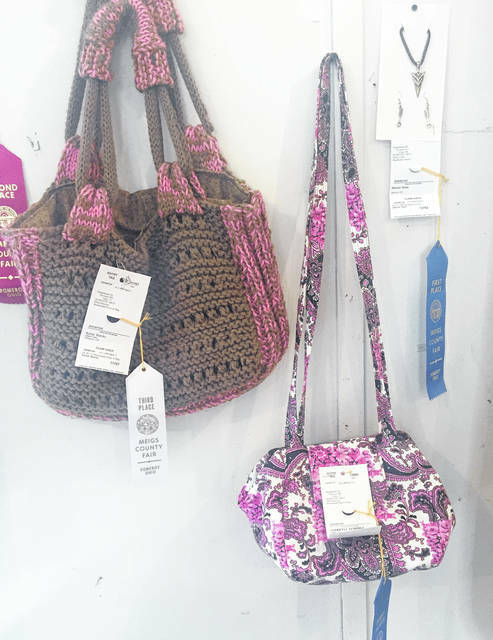 These purses were among those entered in the fair contests. 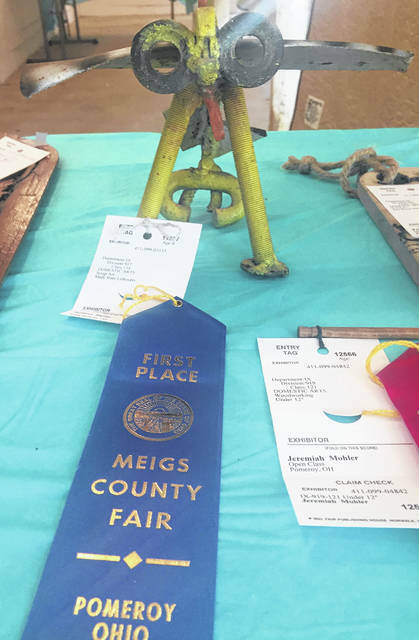 ROCKSPRINGS — Domestic Arts at the Meigs County Fair now has a building dedicated to the craft. This year’s entries were displayed in the new venue which allows for more display space for the hand made items. As a result of the new location, visitors have an opportunity to view entries close up and appreciate the detail in the articles on display. Division 901-Children’s Clothing: Class 1-Dress — 1st place, Roberta Lewis, Mason, W.Va.
Division 902-Adult Clothing: Class 6-Skirt — 1st place, Ruby Lechler, Rutland; Class 7-Jacket or Coat — 1st place, Brenda Kennedy, Pomeroy; Class 8-Dress — 1st place, Vivian R. Huggins, Rutland; Class 10-Shorts — 1st place, Harvest Lechler, Rutland. Division 903-Miscellaneous: Class 13-Homemade Purse or Bag — 1st place, Patricia L. Aldridge, Reedsville; 2nd place, Karen Hawley, Pomeroy; 3rd place, Alice Hawthorne, Reedsville;; Class 17-Christmas Stocking — 1st place, Alice Hawthorne, Reedsville. Division 904-Fashion Accessories: Class 18-Collar — 1st place, Roberta Lewis, Mason W.Va.; 2nd place, Maxine Dyer, Bidwell; Class 20-Scarf — 1st place, Maxine Dyer, Bidwell; 2nd place, Maxine Dyer, Bidwell. Division 905-Crochet: Class 24-Crochet Toy — 1st place, Mary Ann Shoults, Racine; 2nd place, Roberta Lewis, Mason, W.Va.; Class 25-Shawl or Lap Robe — 1st place, Mary Ann Shoults, Racine; 2nd place, Delores King, Pomeroy; Class 26-Doily 14 inches or under — 1st place, Roberta Lewis, 2nd place, Maxine Dyer, Bidwell; 3rd place, Doris Grueser, Racine; Class 27-Doily over 14 inches — 1st place, Roberta Lewis, Mason, W.Va.; 2nd place, Doris Grueser, Racine; 3rd place, Opal Dyer, Bidwell; Class 28-Crochet Cushion — 1st place, Doris Grueser, Racine; Class 29-Pot Holder — 1st place, Maxine Dyer, Bidwell; 2nd place, Roberta Lewis, Mason, W.Va.; 3rd place, Opal Dyer, Bidwell; Class 31-Cap, Hat — 1st place, Delores, King, Pomeroy; Class 32 Scarf — 1st place, Roberta Lewis, Mason, W.Va.; 2nd place, Opal Dyer, Bidwell; 3rd place, Mary Ann Shoults, Racine; Class 34-Any Crochet Item not Listed — 1st place, Roberta Lewis, Mason, W.Va.; 2nd place, Mary Ann Shoults, Racine. Division 906-Knit: Class 35-Knitted Mittens, Gloves — 1st place, Susy Heck, Pomeroy; Class 36-Knitted Cap, Hat — 1st place, Susy Heck, Pomeroy; 2nd place, Harvest Lechler, Rutland; 3rd place, Karen Hawley, Pomeroy; Class 37-Sweater, Child — 1st place, Susy Heck, Pomeroy; Class 38-Adult Sweater — 1st place, Julia Bancroft, Rutland; Class 39-Sweater Set, Baby — 1st place, Susy Heck, Pomeroy; Class 40-Scarf — 1st place, Susy Heck, Pomeroy; 2nd place, Karen Hawley, Pomeroy; 3rd place, Heather Dailey-Johnson, Racine; Class 41-Shawl — 1st place, Susy Heck, Pomeroy; Class 42-Vest — 1st place, Susy Heck, Pomeroy; Class 43-Toy — 1st Place Harvest Lechler, Rutland; 2nd place, Susy Heck, Pomeroy; 3rd place, Opal H. Huggins, Rutland; Class 44-Any Knit not listed — 1st place, Susy Heck, Pomeroy; 2nd place, Karen Hawley, Pomeroy; 3rd place, Heather Dailey-Johnson, Racine. Division 907-Afghans: Class 45-Crocheted Baby Afghan — 1st place, Opal Dyer, Bidwell; 2nd place, Doris Grueser, Racine; 3rd place, Maxine Dyer, Bidwell; Class 47-Knitted Afghan — 1st place, Susy Heck, Pomeroy; Class 49-Crocheted Ripple — 1st place Maxine Dyer, Bidwell; Class 50-Crocheted Granny Square — 1st place, Opal Dyer, Bidwell; Class 51-Any Variation of Crocheted Granny Square — 1st place, Opal Dyer, Bidwell,; Class 53-Any Shell or Variation — 1st place, Opal Dyer, Bidwell; Class 55-Mile a Minute — 1st place, Opal Dyer, Bidwell; Class 56-Any Other Not Listed — 1st place, Doris Grueser, Racine. 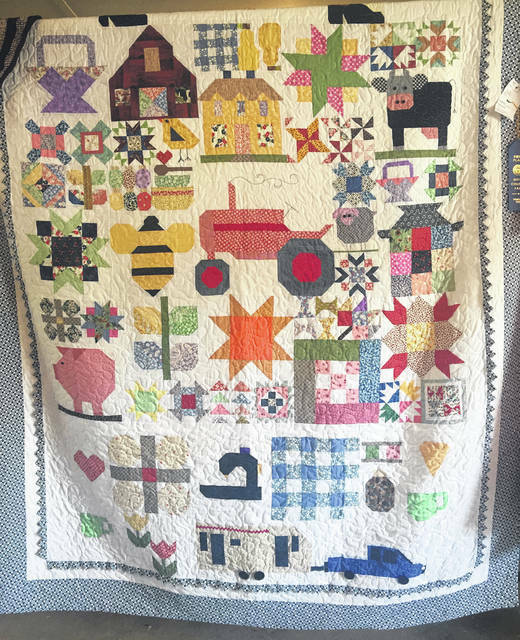 Division 908-Quilts: Class-58-Floss Embroidery — 1st place, Brenda Kennedy, Pomeroy; Class 59-Cross Stitch — 1st place, Delores King, Pomeroy; Class 61-Machine Quilted — 1st place, Debbie Duvall, Reedsville; 2nd place, Sheila A. Rush, Long Bottom; 3rd place, Brenda Kennedy, Pomeroy; Class 62-Child’s or Crib — 1st place, Delores King, Pomeroy; 2nd place, Doris Grueser, Racine; 3rd place, Brenda Kennedy, Pomeroy; Class 63-Any Other Quilt Not Specified — 1st place, Brenda Kennedy, Pomeroy; Class 65-Patchwork — 1st place, Brenda Kennedy, Pomeroy; 2nd place, Delores King, Pomeroy; 3rd place, Debbie Watson, Coolville; Class 69-Quilt Made by a Group — 1st place, Brenda Kennedy, Pomeroy; Class 70-Any Other Not Specified — 1st place, Brenda Kennedy, Pomeroy; 2nd place, Alice Hawthorne, Reedsville. Division 909-Rugs: Class 74-Any Other Rug — 1st place, Roberta Lewis, Mason, W.Va.; 2nd place, Mary Ann Shoults, Racine. Division 910-Needle Craft: Class 75-Counted Cross Stitch Picture — 1st place, Patricia L. Aldridge, Reedsville; Class 76-Embroidery Picture — 1st place, Mary Ann Shoults, Racine; 2nd place, Vivian R. Huggins, Rutland; Class 80-Embroidered Pillow Case — 1st place, Harvest Lechler, Rutland; 2nd place, Doris Grueser, Racine; Class 85-Patchwork Cushion — 1st place, Ruby Lechler, Rutland; Class 87-Any Stuffed Toy — 1st place, Ruby Lechler, Rutland; 2nd place, Opal H. Huggins, Rutland. Division 911-Dolls: Class 89-Cloth Doll — 1st place, Shirley Hamm, Racine; Class 90-Character Doll — 1st place, Shirley Hamm, Racine. Division 912-Holiday Craft: Class 93-Hand Made Ornaments — 1st place, Maxine Dyer, Bidwell; 2nd place, Opal Dyer, Bidwell; 3rd place, Karen Hawley; Class 94-Tree Skirt — 1st place, Opal Dyer, Bidwell; Class 95-Holiday Wall Decoration — 1st place, Rhonda L. Dailey, Racine; 2nd place, Patricia Aldridge, Reedsville; Class 96-Holiday Wall Decoration — 1st place, Patricia Aldridge. Division 913-Class 97-Articles By Any New Hand Craft — 1st place, Patricia L. Aldridge, Reedsville; Class 98-Handmade Jewelry — 1st place, Sharon Dean, Racine; 2nd place, Ruby Lechler, Rutland; Class 99-Plastic Canvas — 1st place, Opal Dyer, Bidwell; Class 100-Plastic Canvas — 1st place, Opal Dyer, Bidwell. Division 916-Sweatshirts, Etc. Purchased Decorated: Class 113-Any Item Not Listed — 1st place, Ruby Lechler, Rutland; Class 114-Made from Leftovers — 1st place, Robert Bailey, Long Bottom; 2nd place, Patricia L. Aldridge, Reedsville; Class 116-Anything Not Listed — 1st place, Patricia L. Aldridge, Reedsville. 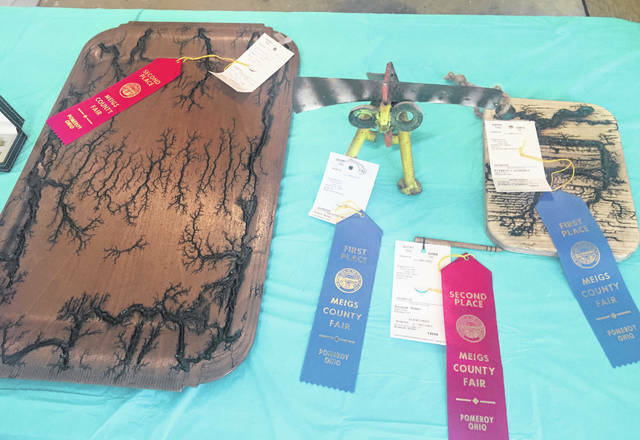 Division 919-Woodworking: Class 121-Under 12 inches — 1st place, Heather Dailey-Johnson, Racine; 2nd place, Jeremiah Mohler, Pomeroy. Division 920-Wood Art: Class 124-Any Wood Item Not Over 36 inches — 1st place, Patricia L. Aldridge, Reedsville,; Class 125-Any Other Wood Art — 1st place Danny Carter, Vinton; 2nd place, Patricia L. Aldridge, Reedsville; 3rd place, Carol A. Carter, Vinton. https://www.mydailysentinel.com/wp-content/uploads/sites/14/2018/08/web1_8.17-Domestic-Arts-1-Hamm_ne2018816141338197.jpgShirley Hamm took the top prize for her Raggedy Ann and Andy dolls. https://www.mydailysentinel.com/wp-content/uploads/sites/14/2018/08/web1_8.17-Domestic-Arts-2-Kennedy_ne2018816141340640.jpgBrenda Kennedy received 1st Place for quilts. 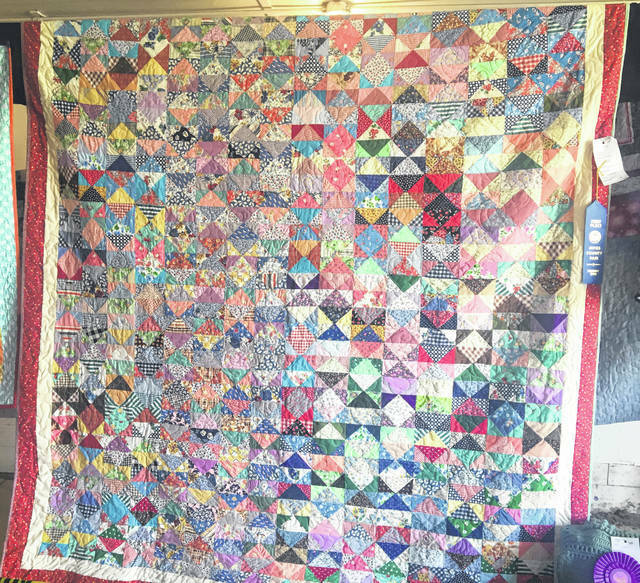 https://www.mydailysentinel.com/wp-content/uploads/sites/14/2018/08/web1_8.17-Domestic-Arts-3-Kennedy_ne201881614134866.jpgBrenda Kennedy received 1st Place for quilts. https://www.mydailysentinel.com/wp-content/uploads/sites/14/2018/08/web1_8.17-Domestic-Arts-4-Bancroft_ne2018816141352679.jpgJulie Bancroft knitted this 1st Place sweater. https://www.mydailysentinel.com/wp-content/uploads/sites/14/2018/08/web1_8.17-Domestic-Arts-5-Carter_ne2018816141358533.jpgWith his woodcraft birdhouse, Danny Carter of Vinton took 1st place with his Mail Pouch Birdhouse. https://www.mydailysentinel.com/wp-content/uploads/sites/14/2018/08/web1_8.17-Domestic-Arts-6-Woodworking_ne201881614142564.jpgWoodworking projects were among the domestic arts items entered in the fair contests. https://www.mydailysentinel.com/wp-content/uploads/sites/14/2018/08/web1_8.17-Domestic-Arts-7-Bailey_ne201881614148676.jpgScrap Art by Robert Bailey took first place. https://www.mydailysentinel.com/wp-content/uploads/sites/14/2018/08/web1_8.17-Domestic-Arts-8-Purses_ne2018816141415155.jpgThese purses were among those entered in the fair contests.